My week-long trip to Maui and Waikiki ended with the 12th annual Spam Jam, a celebration of Hawaii’s treasured meat product. When I told people I was covering the Spam Jam this year, they either looked at me in utter bewilderment or complete fascination. Some people turned their noses. Others laughed. And some looked at me with an inquisitive eye. Spam has gotten a bit of a bad rep in the continental United States, bolstered by the perception that it’s a “mystery meat.” But in Hawaii and in other parts of the world, Spam is actually celebrated and embraced. In Hawaii, the Hormel product (which is a blend of pork shoulder meat and ham, by the way) traces back to World War II, when it was a popular item among the military. It’s embedded in Hawaii’s culture, and it signifies more than just a food item. Nearly seven million cans of Spam are consumed each year in Hawaii. 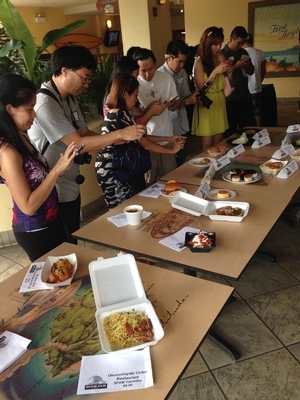 The popularity of Spam in Hawaii was exemplified to the utmost degree at the 2014 Spam Jam on May 3. 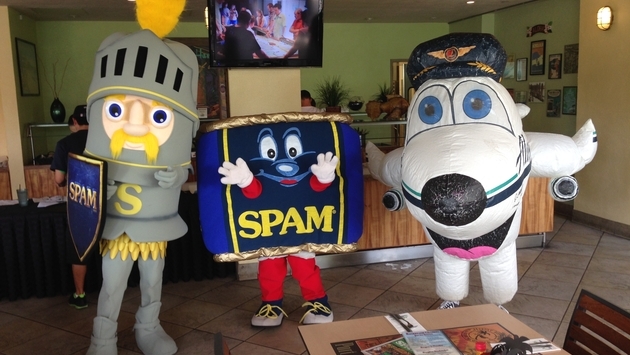 Spam Jam has really taken off in recent years, attracting more than 25,000 attendees in each of the last two years. It’s an all-day event, beginning at 4 p.m. and officially ending at 10 at night (although some still hang around after that and mingle). A variety of booths manned by volunteers are set up on Kalakaua Avenue, from Spam-related items like T-shirts and shorts to Spam products in virtually every form you can think of. There are also booths set up to encourage visitors to donate cans of Spam to the Hawaii Food Bank. The Tweet-Up, hosted by Jimmy Buffett’s at Holiday Inn Waikiki Beachcomber Resort, features about 60 of some of the most active Twitter members in the world. A variety of Spam items are placed on tables and the participants have to tweet and feature the items on various social media accounts to be entered into a drawing to earn a bunch of free stuff. Prizes include Spam Jam T-shirts, gift cards to restaurants and shops, hotel credits, a one-night stay at Waikiki Beachcomber, “Elite” status with Alaska Airlines and plane tickets to Alaska. The contest itself is actually pretty intense. One guy had two big digital cameras hanging over both of his shoulders and appeared to be fighting for position at the tables. He knocked into a few people along the way (it could have been by accident, but my feelings are that he was trying to bully his way through people). When the items were first placed on the tables, I didn’t realize that the actual Tweet-Up had officially begun, so I casually wandered over to the tables to take pictures. Bad idea. I was instantly surrounded by a throng of people and I had to get out of there before I was basically swallowed up. As for the Spam items I tasted, I had quite the selection before me. Spam-infused products included: nachos, ramen, burritos, lettuce wraps, chili, fried rice, pancakes, fries, flan, macadamia nut sundae, noodles, won tons, pizza, and popsicles…just to name a few. Of course, Hawaii’s popular Spam musubi was featured (a roll composed of Spam, rice and seaweed). There was even a Spam Philadelphia cheesesteak, a unique creation that actually won one lady and her husband a trip to Waikiki and the Spam Jam. I was able to talk with Bitsy Kelley, vice president of corporate communications for Outrigger Enterprises Group (one of more than 20 sponsors for the event). Not only is Kelley the granddaughter of Estelle and Roy Kelley, the founders of Outrigger Hotels & Resorts, she also was the one who came up with the idea to bring Spam Jam to Hawaii (the original Spam Jam was held in Minnesota) before Outrigger Hotels & Resorts Vice President Barbara Campbell took it and ran with it. Kelley practically bursts with energy, and I could tell right from the start that she was passionate about Spam Jam. In addition to knowing about the Minnesota Spam Jam (which no longer exists), Kelley also thought of Spam Jam from Outrigger’s initiative to cook breakfast (with Spam) for housekeepers during International Housekeepers Week (held in September). And, indeed, Spam Jam has truly become an international event. Attendees hailed from Australia to the Philippines to Texas. It also doesn’t hurt that Spam Jam just happens to take place during a great time to visit Hawaii. Not only is Waikiki’s weather great in the spring (high 70s to 80s), it’s usually not as crowded as in the summer months. The month of May is also the kickoff of Waikiki’s big swell for surfing, said Kelley, an avid surfer herself (I was able to take a stroll over to the Diamond Head area on the east side of Waikiki Beach before Spam Jam and there’s some great surfing over there). Throughout the day, the Spam Jam street festival bustled with activity as thousands of visitors wandered from vendor to vendor. Several Hawaii-based radio stations hosted live music, attendees mingled with a variety of mascots (from Spammy and Sir Can-a-Lot to Alaska Airlines’ Buddy) and there was even fire knife dancing. Spam Jam also boasted a “wave” entirely constructed of Spam cans (more than 1,000). Yep, Spam Jam is going strong and getting stronger. And it’s all due to the support of the passionate people of Hawaii.